There is an interesting new restaurant opened in Wolverhampton, where the branch of Pizza Hut used to be in the town centre on Victoria Street. 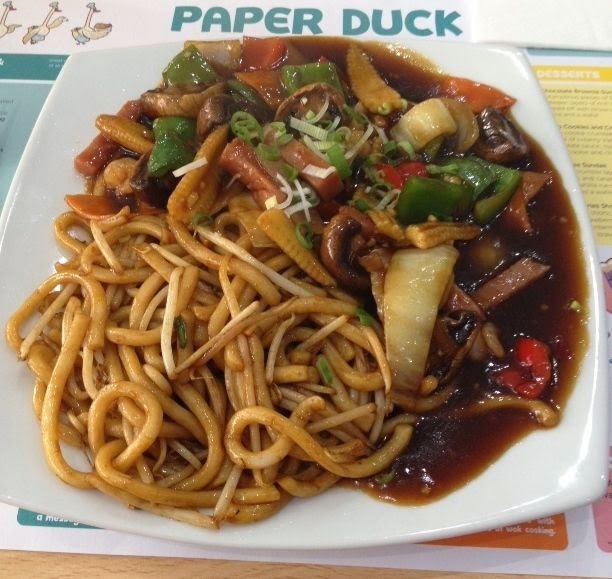 Although there is another Paper Duck restaurant in Kent, which is a buffet, this branch seems related but distinctly different, for a start you order from the menu. The menu is also the paper placemat on the table, which is kind of cool too. The restaurant is essentially a mix of different regions, from Chinese to Japanese, and it describes itself as a noodle bar, but it offers a good range of rice dishes too! The place certainly looks the part, there are benches to sit on, comfy chairs too, but unlike Wagamama the seating is a bit more private, and the decorations on the walls is fabulous and modern. There is honestly nowhere else quite like it in our city. From this, loads of food arrived, I had a large plate heaped with goodies. The noodles were thick, soft and fun to eat. They were chunky and substantial, but a bit fiddly with the old chop sticks! The stir-fry itself was perfect. The sauce had a rich flavour, but all the elements of the Singapore Special shone through. The peppers were fresh and had a bit of crunch, as did the onions. The shrimps gave a gentle saltiness to the mix, and the ham had a slight sweetness. Every mouthful was different, and the mix of textures was pure heaven. I couldn’t get enough of it. My mum opted for sweet and sour prawns with egg fried rice. 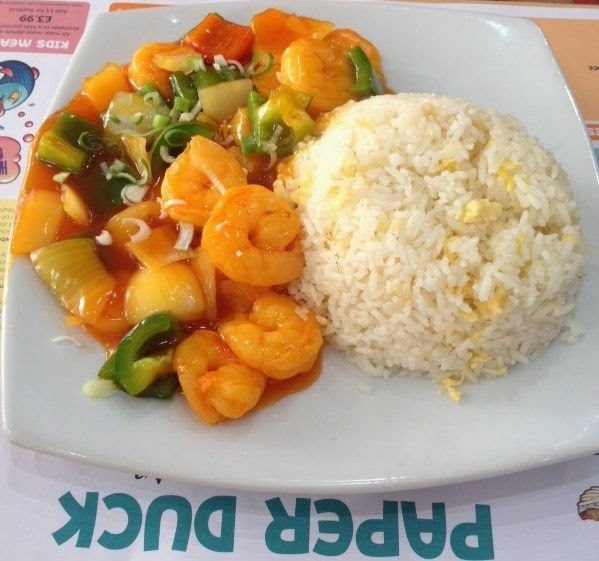 She thoroughly enjoyed her meal too, the prawns were succulent, the sauce was well balanced and not too sweet and the rice was perfectly fluffy. We were both very impressed in terms of the balance of flavours, and the freshness of the ingredients. The speed at which we had been served up till then was also good too. We had a look at the dessert menu, and both opted for the Oreo Cookie Cream Sundae. What followed was the only negative part of the meal, and that was a slight delay in being served. The restaurant had got a bit busier, but wasn’t full, and we had to ask twice to remind them about our puddings. When they came though, they were worth the wait! 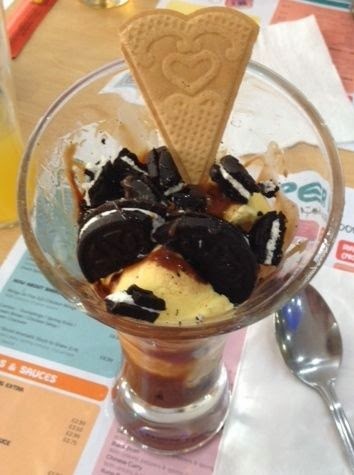 The sundaes were big, with lots of ice cream, chocolate sauce and crumbled biscuits, all topped with a wafer - heaven! It is so nice to see a new restaurant like this opening up in Wolverhampton. It is something a bit different, and the food quality is top notch. 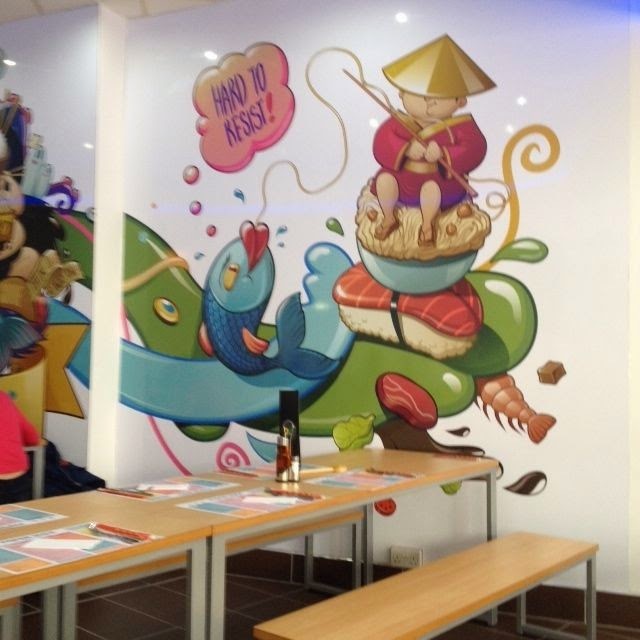 I’m hoping the delay in the puddings was just down to teething problems because if they sort that out it will be the perfect place to go for your noodle craving! Our main course (at lunch time) were £6.99 each and the desserts were £3.99 so I can’t argue with the value either. Definitely a place I’ll be going back to, and hopefully somewhere which will bring people into the centre. I Will never again go to the paper duck! worst service I have ever encountered in my life! 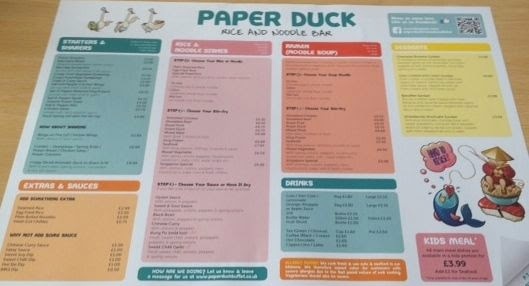 I went to paper duck on Thursday of last week with 3 of my friends and a young child, as it was one of my friends birthday's. We ordered our food and drinks ( There was us and another couple in there so it was relatively quiet) after about 10 mins the waitress came back to us and informed us that they had no bottled water so could we pick something else!! (Ok we are in the centre of Wolverhampton so obviously they could not go and get some). So the 2 of us that picked water changed our drinks order. After another 10 mins she comes out again and tells us there is no salt and pepper wings either!!! Ok so we changed the 2 starters as well to something they had got. 2 of the starters came out (the ones they did have!) and after another 10/15 mins later the other 2 starters came out.3 min's later they bought the 4 main causes out we hadn't even finished our starters as we had to wait an hour at this point! we asked were the child's meal was and was told it was on its way! after a few more min's we asked again where the childs meal was and was told not long! in the end we fed the little girl off our plate as she was starting to get hungry. The childs portion eventually came out and we sent it back as she was now sorted as we fed her off our plates. In all this time no plates were even removed from our table and we will never go there again!